Signing a cultural landmark to improve wayfinding across the external precinct. 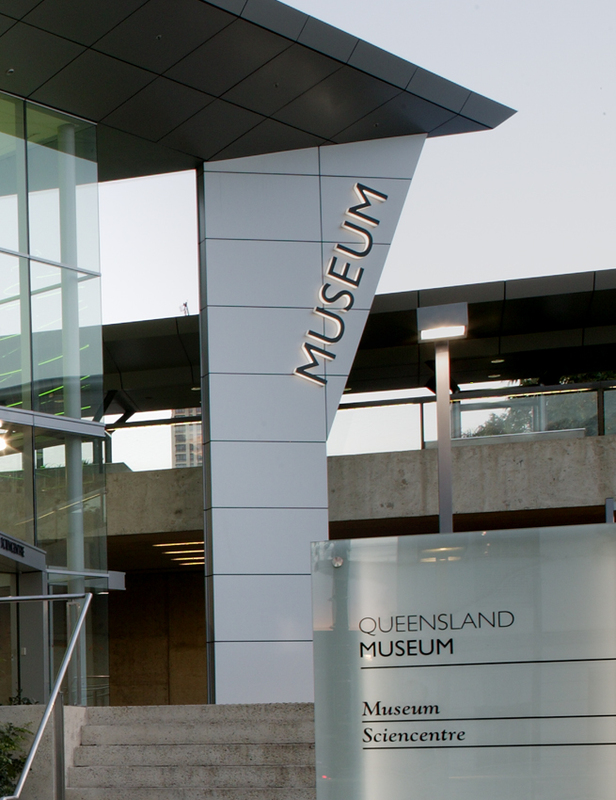 The Queensland Museum & Sciencentre is a flagship for the Queensland Government’s heritage and cultural program and welcomes over 560 000 visitors annually. 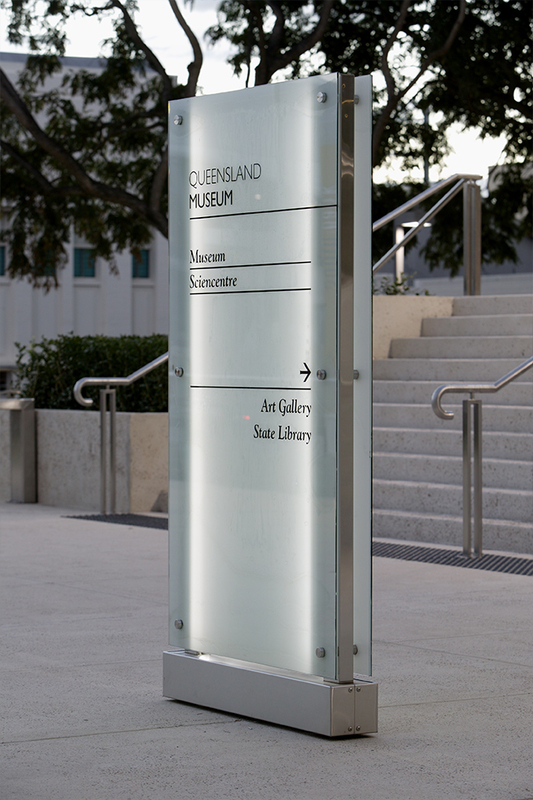 Located within the South Bank Cultural Precinct in South Brisbane, Queensland, Australia, we were commissioned to design a series of entrance and directional signs to lead people though the Queensland Museum plaza and entrance which was designed by Robin Gibson Architects. 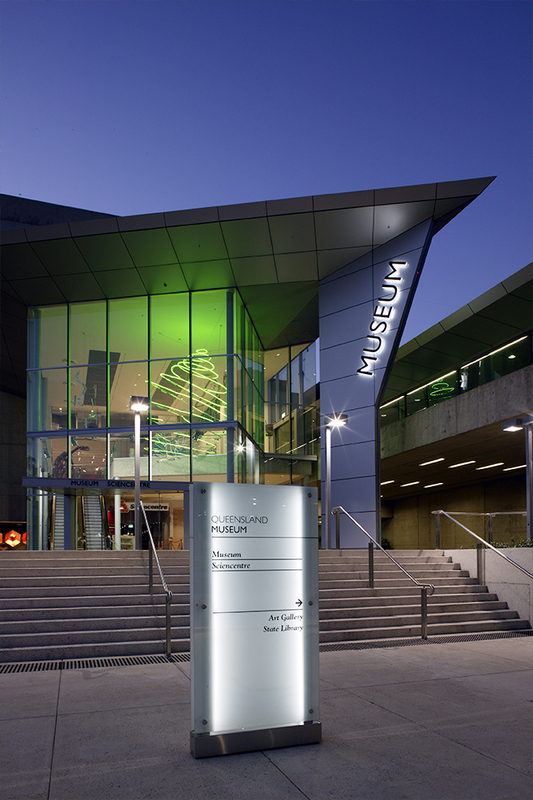 Our brief was to modernise the existing Cultural Centre signage, that we had previously developed in the early 1990s, by referencing the materials and colours used in the new Museum entry. 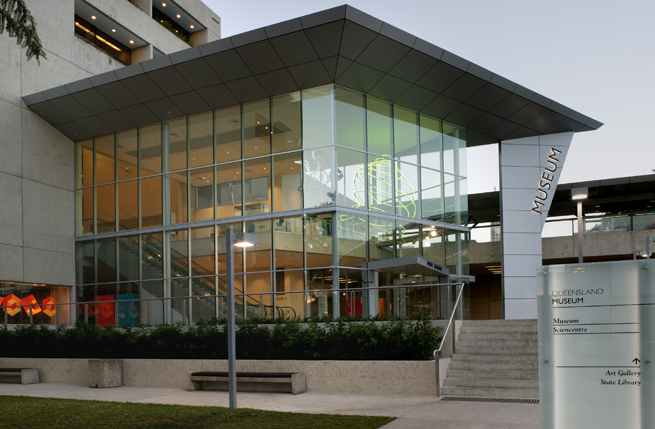 The new entrance was designed to increase visitor accessibility from the street level plaza to the upper museum level and the new Sciencentre. 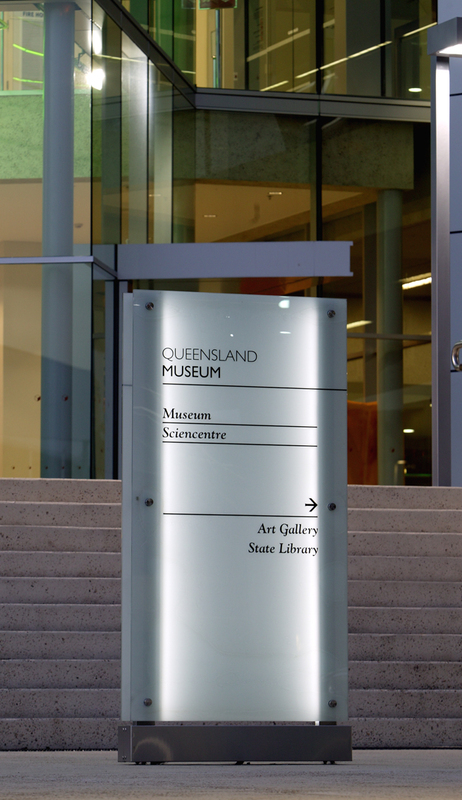 The sign types were modernised by referencing architectural materials and principles from the new entrance through the use of frosted glass, aluminium and stainless steel to give the new signage a clean, light and transparent quality. In executing the design we had to ensure that the new signs worked in with the existing black and copper scheme by keeping the overall dimensions, size and style of message on the sign identical to that of the existing sign system. 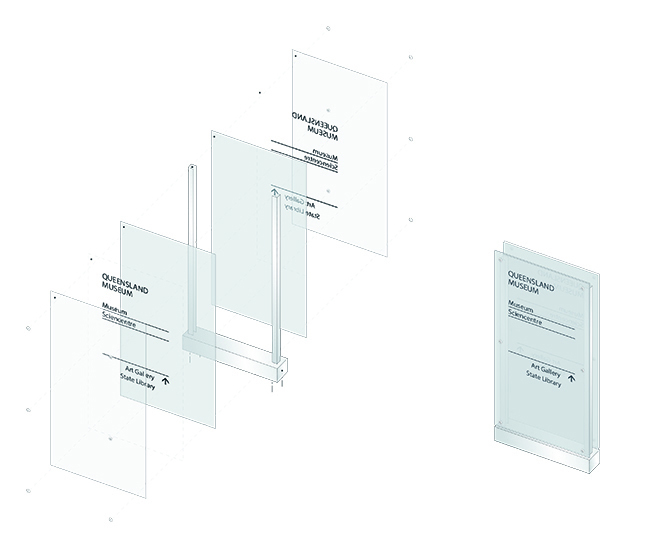 Typefaces, information hierarchy and arrows of the old identification and direction signage scheme have been retained for brand consistency, but the look has been modernised using new materials to reflect the new entrance's glazed architecture. 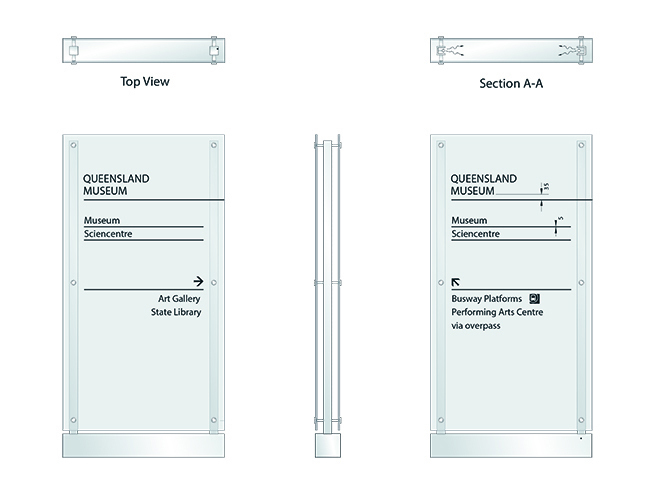 See other cultural wayfinding (link to Museum project) and interactive signage projects.